Once all of your employees’ important items have been packed inside their crate, they can easily be maneuvered, whether they are heading to the opposite side of the building or being loaded up on to the moving truck. 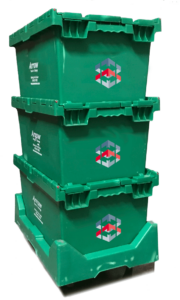 After your move is complete, Arrow’s Eco-Crates will be used again for another move. Why use cardboard boxes once and then throw them out? With Arrow’s Eco-Crates we will be reducing the overall cost of your move, eliminating any unnecessary disposal costs and saving trees. We believe in reducing our footprint and take every reasonable measure from recycling our shredding waste to expanding our usage of Arrow Eco Crates. For more information about how Arrow Transfer & Storage can help make your relocation green, please feel free to get in touch with us today.